This puzzle consists of 9 wooden bars which, when put together in a 3×3 arrangment form a cube. 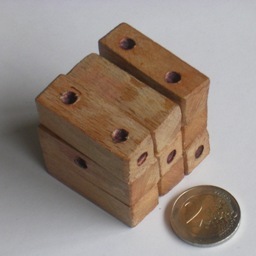 The bars are decorated with spots (either painted or as drilled holes or dimples), and the aim is to form a spotted cube that looks exactly like a regular die. Note that the opposing faces of a die must add up to 7. The nine bars are shown below. The sides not shown have no spots. 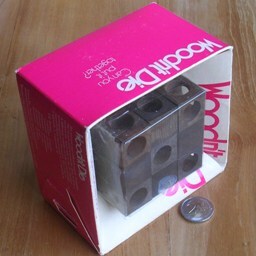 Mag-Nif produced this puzzle in 1974 using the name "Woodn't Die", but it is much older. It is mentioned in Professor Hoffman's "Puzzles Old and New" (1893) as The "Spots" Puzzle made by Wolff & Son. The solution to the puzzle can be found through logic alone, without the need for trial and error. There are 21 spots on the pieces, and a die has 21 spots, so every spot must be on the outside of the cube. There can be no spots that are hidden by other pieces. There are only 5 bars with spots on one or both ends, so the face showing the 6 must be formed by the spots on the side of the bars. There are no bars with 3 dots on one side, so the face showing the 6 must be formed by three bars showing 2 spots each, i.e. three of the bars A-D. The bars A and B have spots on two sides, so they must form the outside of the 6 face. The spots on the ends of bar C preclude it from being the middle bar of the 6 face, so the 6 face is formed by A, D, and B in that order. The side of bar B has one spot near one end. The only other bar to have a spot on its side near one end is E, so E must combine with B to make the 2 or 3 face. The second side of bar A has two spots. The only other remaining bar to have two spots on its side is C, so C must combine with A to make the 4 or 5 face. In between the C and E bars we must have an F bar to form the 1 face opposite the 6 face. We now have A, D, B forming the 6 face, C, F, E forming the opposing 1 face, and have F, G, H remaining to form the middle layer. The middle layer must provide the centre spot for two of the faces. Bar G has a spot on one end, so it must be in the middle between F and H.
The middle layer can be placed eight ways, four of which make a valid die (the other four lead to a die with repeated numbers). The four solutions are shown below. The other variant of the puzzle is solved in exactly the same way, the only difference being that the spots in the 2 or 3 face lie on the other diagonal.